Leonardo di Caprio has this week taken over as global ambassador for this year's theme with the IFAW. The International Fund for Animal Welfare is reminding us that it's twenty years since the ivory trade ban was put in place. Unfortunately it is going to take much more than a simple ban. Some African countries in particular have rescinded on the successful recovery they had made in combating poachers. These countries now have elephant extinction staring them in the face. Leo has begun by making his statement. "The ivory trade fuels conflict and strife. Elephants are killed by poachers so their tusks can be traded for weapons and drugs by international criminal organizations before becoming trinkets and jewellery for consumers. Authorities in 85 countries have seized almost 400 tons of ivory on the black market since the 1989 ivory trade ban." With 1.3 million elephants in 1979, we only have half a million left in 2011. We have become familiar with news like this recently, but what action to take? Adding your signature to a million others might be the successful IFAW method, as many of those surveyed, particularly in Australia and UK, think elephants could survive the removal of their tusks. China has the biggest market for illegal ivory and a quite unbelievable 70% who, in 2007, doubt that elephants are killed for their ivory. The aim is to provide teachers and students with packs that celebrate elephants. President Fred O'Regan wants to create a groundswell for elephant protection that cannot be ignored. IFAW concentrate on this education aspect and remind the Dumbo and Jumbo generations that the animal is an attractive, essential part of life even though its care may be difficult in the modern environment. It certainly was difficult in the barbarous past to preserve the image of the elephant in Africa. The continents seem at odds on how they view what for some is almost an alien creature. 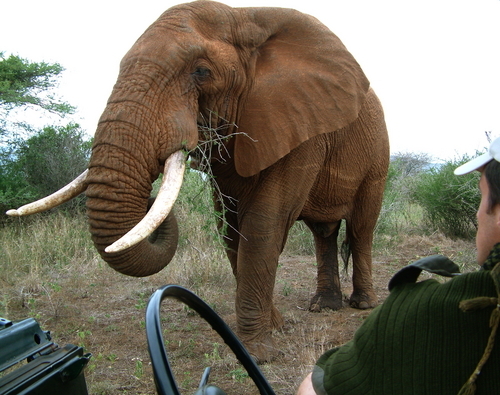 Film has provided us with insights into elephant lives in the past. We really need to evoke a mammoth coverage literally, if educating is going to involve fossil history, elephant relatives, or human influence from Hannibal to the humble mahout or phanet.